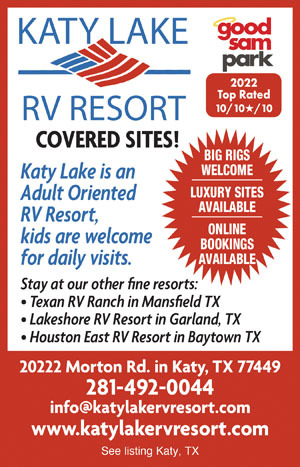 Conveniently located on I-10 in Baytown, this gated top-rated park features a beautiful pool, recreation and cabin rentals. 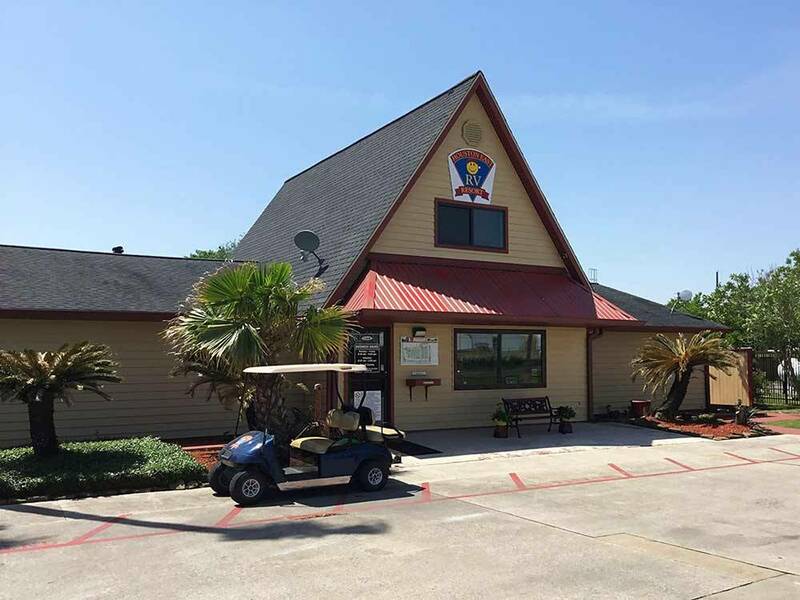 Close to recreation complex, water park, golf clubs, restaurants and shopping areas. Overnight stop on trip. Convenient easy on - easy off I-10. Park staff reserved a drive through so we didn't even need to unhitch. Called us on the road to confirm our p.m. arrival and were ready for us when we got there. Park clean and well maintained. Considerable road noise, but that's to be expected given the location very close to the freeway. We would stay again. Place is very clean but if you are 35 ft or more in length do not stay here. Way too tight. Not conducive for CL A motor coaches. I had to wake up a fellow RVer and request he move his truck and even then very hard to negotiate. Even the front entrance is too tight when you check in. Great park. Outstanding staff. Would definitely stay again. Clean, no signs from freeway (hard to see where to turn off). Good for stopover. RV's are packed in like sardines. Some spots have picnic tables but others (like ours) don't. There is no where for children to play if you have any. Our children couldn't even play outside the 5th wheel because there was a road right in front and behind us that are very narrow. Dogs are allowed and I was up all night between the whining of a dog next to us and the loud highway. It is close to the highway, really it's way to close. Even with the TV up loud we still heard the highway. There is a $50 refundable deposit IF YOU GIVE THEM A 5 DAY NOTICE! Even for weekly customers. We travel full time and we have never encountered a place that charges you a $50 deposit and requires a 5 day notice on a weekly stay. Often we have to move before a week is even up so we are already wasting money given our pipeline job lifestyle. We pulled in on a Sunday (the office is closed on Sundays). I wouldn't have even stayed a night except for my husband was required to pay upfront over the phone so we stayed the night. The pool looked nice even though it is right next to the highway. It was closed given it's March. We woke up the next morning complained and got out of there as fast as we could. This place would work for a single person traveling for work if they are a deep sleeper. Otherwise, if you have a family PASS on by and go to the dozens of other places in the area. Long level FHU with cable and decent WIFI. Convenient to interstate. Nice bathrooms. Mix of travelers, workers, and seasonal. Only complaint is the large unneutered Pit Bull roaming loose. Ok for an overnight stop. In the front of the park, where we stayed, the noise from I-10 was noticeable. The showers & toilets have recently been refurbished. They had attractive tile, their ad said partially handicapped accessible, that is accurate. The laundry room is open 24 hours, nice feature. Machines took credit or debit cards, worked fine. Pool looked nice, too cold outside when we were there to use it. Some lots had trees, our site did have a puddle that lasted awhile after the rain stopped. Some sites had picnic tables, some did not.